The house on MacFarlane’s Landing has been a bone of contention between the families since the MacFarlanes lost it to the Buchanans on the turn of a card. Logan MacFarlane wants the house back for his grandfather, India has no intention of selling. She has plans for the house and is hoping her great aunt will be home from hospital very soon. India had promised to help look after Elspeth as well as bring her ideas to fruition. In a delightful opening sequence, Logan roars up to the house on his Triumph motorbike, all dangerous male, and India, not knowing who he is and aware of the isolation of her house, picks up a monkey wrench to defend herself. This is just the first of many clashes. They both have the best interests of their respective relatives at heart and as their encounters become ever more heated, there’s a spark of something neither wants to admit to. Logan imagined standing once more in front of the Buchanan residence which had one of Door County’s famous lighthouses built almost in its back yard, towering over it. With its wrap around veranda and views overlooking MacFarlane’s Landing and the Bay it was prime real estate. It’s descriptions like this that bring to mind vivid imagery and the atmosphere of the beautiful setting, a calming backdrop to the tension surrounding the dispute over ownership of the house and land. Logan and India are both fiery characters with surprisingly similar upbringings. They have strong family ties and the relationships with their relatives are lovely. Logan is quite aggressive initially and not at all the type of man India is used to. As his character is explored in more detail and he shows his caring and vulnerable side he’s much easier to fall for. India is independent and determined, having been shipped off to school as her parents moved from one diplomatic post to another. Her mother has her own idea of how India’s life should unfold, and it isn’t running a glorified B&B. But India is committed to her plans. The characters, including the secondary ones, are wonderfully drawn and there’s lots of snappy, entertaining dialogue. The history between the families is intriguing and not what I imagined. It shows how a dispute can escalate and impact on future generations. As the barriers begin to seem insurmountable….will they find a way? You’ll have to read it to find out! 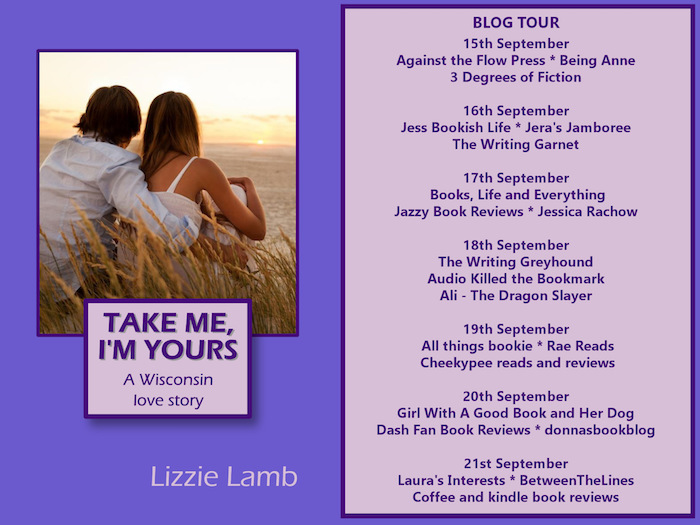 I chose to read and review Take Me, I’m Yours based on a copy of the book supplied by Rachel’s Random Resources and the author. I’ve loved all of Lizzie’s Scottish novels and wasn’t sure at first, about this change of scene! Have to say, I really enjoyed it!! I love the Scottish ones too, but I also love this setting. 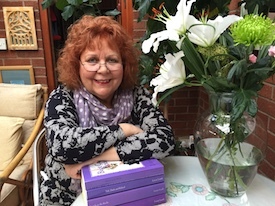 A great blog post and review to ‘go into the weekend on.’ This novel has been demanding that I write it for so long and I’m glad that I left Scotland (temporarily) and did it. I’ve had some great feedback as a result of this blog tour but this review is extra special. Thanks, Cathy. You’re very welcome, Lizzie. I really loved the setting. Ah… the feuding families, hate to love trope….. I can’t help but like it! Lol.